Getting started in researching your family can be difficult. There is a lot to learn, both about how to do the research, but also about the tools needed to organize your research. As you move forward, I always recommend to people to invest in a good genealogy program on their computer, but at the beginning it can sometimes be easier to work on paper. 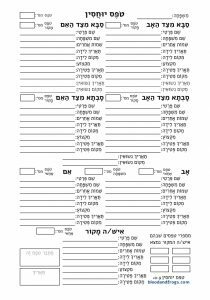 In this day and age, when I say paper this can also mean the virtual kind – PDF forms. There is no need to actually print out PDF forms, so you can keep them on your computer, share them, etc. without needing to waste real paper. I have designed a series of forms I call the B&F Forms System. You can use most of the forms by themselves, but it is a system because the forms complement each other and can be linked together. For example, you might start with an Ancestor Form (sometimes called a Pedigree Chart) where you fill out information about yourself (the Source Person), your parents and your grandparents. If you know about generations going back further than that, you can start a new Ancestor Form with one of your grandparents as the Source Person. If you want to enter information about the Source Person’s siblings, or the siblings of their parents, you can fill out a Sibling Form. 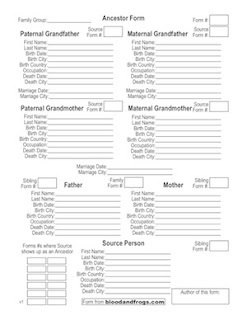 For parents in the Ancestor Form, you can fill out a Family Form which shows information about the parents and up to six children. If you need to add more children, you can add them to a Sibling Form. For each sibling in a Sibling Form, you can create a Family Form and write the number of the Family Form next to the name of each sibling. These are just some of the examples of how the forms interconnect, creating a full system of forms. I invite you to go check out the forms yourself, try them out, and send me feedback (you can comment on the bottom of the Forms page). In the future I will update the forms based on user feedback, and I will also be adding some new forms, such as research-specific forms. As Genealogy Day is coming up this Saturday, if you have been looking for a way (and an excuse) to get started in your family research, now you have some forms that can help get you started. So go check out the B&F Forms System.